SPECTACULAR 270 DEGREE VIEWS-DIRECT OCEANFRONT ON CORNER! PREMIUM 2BR/2BA! beachfront corner unit on the 11th (out of 12) floor is directly on Kaanapali Beach and has stunning, magnificent, unobstructed 270 degree panoramic beachfront views of the Pacific. FREE WIFI! NO RESORT FEES! FREE PARKING! FABULOUS BBQ AREA! 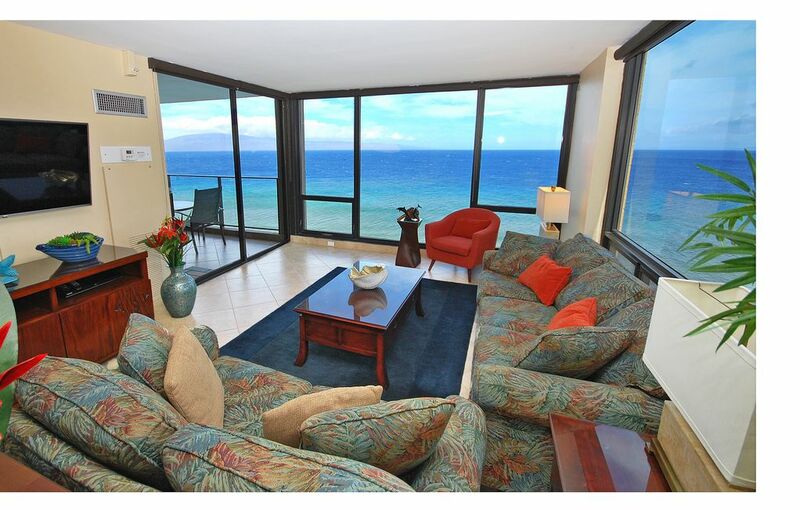 Unit 1109 overlooks the islands of Lanai and Molokai from its floor to ceiling wraparound windows! Being on the corner it is only a few yards from the ocean and the condo has some of the very best views anywhere on the island! The Mahana Resort is a well known upscale resort located on the north end of world famous Kaanapali Beach. The condo is beautifully decorated with island style furnishings including luxurious mahagony pieces and has central air conditioning. Views of the magnificent sunsets and whale watching can be experienced from its premier corner location. In approximately 1400 square feet, the spacious master bedroom offers a king-size bed, cable high definition LED TV, and above all, an OCEANFRONT location and views, which are not found in many bedrooms on Maui. In the large guest bedroom there are two twin beds and LED TV. In the living room, there is an LED TV and floor to ceiling windows. There is free high speed wireless internet access inside the unit, lobby, and around the pool and jacuzzi. Our newly remodeled kitchen is complete with all stainless appliances and ready for you! The Mahana Resort is an upscale private resort located on the north end of Kaanapali Beach. The beautiful grounds include carefully manicured landscaping, tennis court, and newly remodeled swimming pool, jacuzzi, and barbecue area. You may stroll to a variety of nearby restaurants, as well as stores for groceries, souvenirs, diving, and swimming accessories, art, and videos. A short drive away is the town of Lahaina, golfing, an abundance of restaurants, and shopping. We have been serving our guests on Maui since 1998 and look forward to serving you! The Mahana Resort is a nonsmoking resort including inside units and lanais according to Hawaii State Law. Before making a reservation, please recognize that we book our units back-to-back where guests arrive in the afternoon of the same day in which the previous guests depart. If a guest chooses dates that are not back-to-back, then our goal would be to leave a seven night space between bookings since that is what most people request. For example, please do not book 5 nights in the middle of 12 open nights or else it will be cancelled. PLEASE INQUIRE WITH ME WITH ANY QUESTIONS BEFORE BOOKING. There are certainly times where we will accept a reservation leaving a small time gap, but would like to discuss this with you before you book. There are NO amenity or resort fees. We pay all credit card fees except for additional international fees. There is usually a 5 night minimum unless requested dates fit optimally into our booking schedule-please also inquire with questions about this. Payment for Jan and Feb reservations due by November 1 of the prior year. WE WILL NEVER ASK YOU TO WIRE FUNDS OR ADVERTISE ON ANY "LIST." Call for last minute specials. On some dates, we are as low as 1/2 of ASTON'S or EXPEDIA'S RATES! Communication by phone is required within 24 hours of acceptance of a reservation to obtain information and to answer any questions a guest may have. OUR CANCELLATION POLICY: FULL REFUND MINUS CREDIT CARD FEE IF CANCELED MORE THAN 60 DAYS BEFORE ARRIVAL. PLEASE SEE RENTAL AGREEMENT FOR FULL POLICY. What attracted us to this particular area was the upscale resort and its peaceful setting, beautiful uncrowded beaches allowing long walks, water sports, and incredible views of the Pacific and the islands of Lanai and Molokai. Our family was also attracted to its proximity to many restaurants and shops, many within walking distance. Our children especially loved the beach and the many activities of the resort including the pool and jacuzzi. We were particularly attracted to this unit since it was one of the few one bedroom condos we found on the island with both the living room and master bedroom being oceanfront with floor to ceiling windows providing the best of oceanfront views. It was also larger than average which was great for our entire family. Our direct oceanfront views are truly stunning from the 11th floor. Many of our guests describe the view as like 'being on a cruise ship' whether you are on the balcony or in the living room or master bedroom looking through the floor to ceiling windows. Being on a corner, the 270 degree panoramic views of the Pacific with Lanai to the south and Molokai to the north as well as whale watching and beautiful sunsets are unforgettable. Even the guest bedroom has wonderful views from its floor to ceiling windows of the verdant dormant volcanoes of Maui. The resort amenities are for all ages, including the tennis courts, swimming pool, jacuzzi, and saunas. Kaanapali Beach is uncrowded and offers great water sports including snorkeling, swimming and even surfing. Sunning and strolling along the beach are popular or even along the new boardwalk that extends down towards Black Rock. The location of the resort is within walking distance to many restaurants and shopping, and is a short drive away to many more as well as world class snorkeling and golfing. The Mahana Resort is known for its superior quality of travel experience on Maui. Our guests enjoy the beautiful tropical interior and excellent maintenance of our condo as seen in our online guestbook. Spectacular 270 degree oceanfront views, wrapping around the front corner of the building overlooking the beach. Located in a premier corner on the 11th (out of 12) floor with unbelievable views. Located in highly ranked and regarded Mahana Resort in all search engines. Located in a premier corner location on the 11th (out of 12) floor with 270 degree unobstructed views of the Pacific. We are not just 'ocean view', we are ocean front!! Plenty of free parking right out front-one space provided. No fees or gate fees. Free wireless internet service provided. A variety of books left by previous guests as well as games. Beach chairs, boogie boards, cooler, etc. (supply and condition varies from guest to guest). Direct Oceanfront-the Pacific is 30 feet in front of the building. Beautiful landscaping in a peaceful Hawaiian theme; tennis court. Free hi-speed internet access and parking. Pacific ocean right out front for swimming, surfing, snorkeling, whale and dolphin watching in season; very convenient location to shopping, restaurants, entertainment, Whalers Village, and historic Lahaina. Conditions of the beach are constantly changing and since they are subject to the wind, weather, tides, phases of the moon, storms, seasons, and other factors, no guarantees of condition can be given. Definitely a beautiful view. The unit was clean and met our expectations. Well watching from the lanai was excellent and binoculars were provided in the unit. If I had to list any negatives it would be as follows; it would’ve been nice to provide some softer better quality toilet paper. The stuff provided was the absolute cheapest available and was unpleasant to use. Next, there are some crazy policies regarding having to do your own dishes and take out your garbage at threat of being charged additional money if not complied with. Not that big a deal though as the garbage chute at least is situated very close to this unit. There is a sign in the unit indicating that leaving any food of any kind out may result in an aunt or other insect invasion but we saw none during our stay. The owners of the unit seem responsible and reasonable and did respond to my communications. The pool and barbecue area was pleasant and well kept. Note; The building is located beachfront however there is no swimming there. There is a sign indicating that you must not walk on the coral reef which is impossible to do if you want to go swimming in that location. A few feet into the water the reef Begins and continues for about 50 yards. The water in this area doesn’t get deep enough to swim in until you get at least 150 feet out so it is impossible to swim there without walking on the reef which is forbidden. This definitely should have been mentioned in the unit description. Imagine having a family with small children and not being able to swim there! We appreciate your comments but we are surprised after receiving your email after your arrival stating, "Hello William, we checked into your property and it’s beautiful ....definitely meets our expectations. Check was simple and there were no issues with the property. My wife and daughters and I are looking forward to a wonderful week of relaxation and recreation ...thank you ...." Our rental agreement and VRBO listing is very informative about beach and access conditions. As this is winter in Hawaii, it is very common throughout the islands to have some fluctuating beach erosion because of the storms during this time. In addition, you can see from our lanai a larger beach next door to the Mahana, just a 5 minutes walk down the beach or by using the beautiful oceanfront boardwalk. Although all the Hawaiian islands are surrounded by coral reefs, which are the source for the beach sand, the waters off the Mahana Resort are popular for swimming, snorkeling and surfing. The toilet paper used in our condo has a 74% 4-5 star rating on Amazon.com. It is provided by our management company, the most popular management company in West Maui. As we were in Maui during your stay, we invited you to call or write us at any time if you had any questions or concerns. We so much wish we could have explained/rectified all of your issues but unfortunately, you never contacted us. We hope you will be able to visit our beautiful island again in the future. Great location, just passed the end of the boardwalk. Couldn't ask for better views :) Great place to see whales and sunsets from the lanai! Very nicely appointed and well maintained unit in our favorite part of the island. Our vacation was fantastic. The condo had everything we could ever want from cooking utensils to beach chairs. The view from the condo is unparrelled. We saw so many whales, turtles, and dolphins. I would return in a heartbeat. We had a wonderful time in this condo. It is clean and beautifully decorated. And you just can’t beat the view!! It’s amazing! It is just steps from the beach and we really appreciated the beach accessories, such as chairs and towels, that the owner had available for us to use. It is also a very quiet condo as it is at the end of the hall. And I have to mention, the beds were so comfortable! We look forward to visiting Maui again soon and hoping to stay in this condo again! Our favorite stay on Maui so far!! This is a spectacular oceanfront property with incredible views! It is wonderfully appointed, convenient to everything you could want and is absolutely perfect for a relaxing, special Maui vacation. The photos do not do it justice and it so much more than we expected or hoped for. Do not hesitate to stay here for your getaway. You will not be disappointed. Easy experience working with owners. Photos look like what you get. View is incredible. You feel like you are on a ship and you have an outside deck. The west side where the lanai and living room can get extremely hot during the day due to the direct sun, but the solar shades work well and you can still see out. Plus you typically arent in your room during the day. Saw several turtles. So cute. Would highly recommend this unit. Spectacular 270 degree oceanfront, beachfront views, wrapping around the front corner of the building overlooking the beach. Located in a premier corner on the 11th (out of 12) floor with unbelievable views. Beautifully landscaped in a classic peaceful Hawaiian theme with tennis court. Free Hi-speed Internet Access and parking. World famous Kaanapali Beach right out in front for swimming, surfing, snorkeling, whale and dolphin watching in season. Very convenient location to shopping, restaurants, and entertainment, golfing, historic Lahaina, and Whaler's Village.